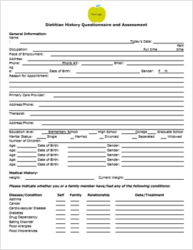 Customized Nutrition Office Forms that can be used by registered dietitians, nutritionists and health coaches. Download these office forms and customize them with your logo and contact information and you are ready to send out to potential referral resources. These ready to use office forms help grow your practice and make your life easier.